That’s essentially all you need to say to me and I am in. When you take away the “No” you are entering into the twilight zone. You just never know what you will get! Maybe I am just always playing it safe, but after too many ruined recipes, I think it’s safe to say baking is NOT my niche. When it happens, it HAPPENS, but when it doesn’t, it’s bad. So today we are sticking with what I do best! And it is very worth it! Recently one of my readers posted a picture of my Blueberry Chia Crumble Bars and it had me craving them big time. How had I not made them in so long?! The problem? I didn’t have blueberries. And I didn’t feel like waiting for the blueberry chia jam to set anyway so any sort of berry wouldn’t do. Needless to say my impatience led me in another direction. I decided it was time to take these bars in another direction: pumpkin! How had I not thought of that earlier?! And by earlier, I mean 15 minutes earlier, because time was ticking and I needed my sweet treat! 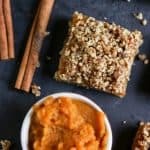 I have plenty of pumpkin recipes on the blog but nothing in the form of a bar so this one just makes sense. The “crumble” is simply a mix of raw nuts (I used almonds and pecans but you can use cashews if you would like as well! ), medjool dates, cinnamon and a few other ingredients. 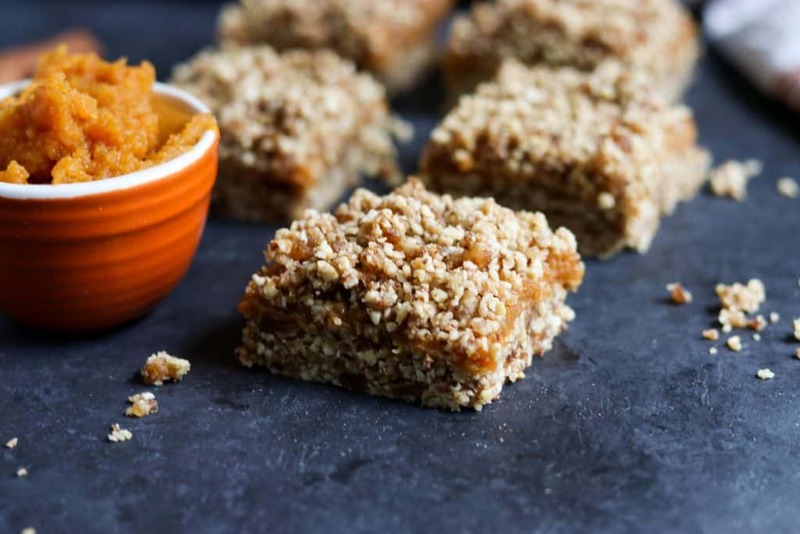 You pop it in the food processor and then part of it is pressed into a pan for the bar and the rest is reserved to crumble on top–or nibble on as you make it if you’re like me! As for the pumpkin layer, some cinnamon, pumpkin puree and maple or sweetener of choice and that’s it! This recipe doesn’t taste like it was that easy to make, but I promise it is easy as pie–or bars for this matter. So now that I have this version, I see a few other flavors coming–and much sooner than later so stay tuned. But until then, get in all the pumpkin you can while it’s the season! In a food processor, process almonds and pecans until grain like consistency. Add in all other bar/crumble ingredients and blend until a crumbly consistency. (Try not to overprocess this. Once the dates are broken down and it seems to be forming almost a dough should be good. Set aside about 2/3 c of the crumble to use later. Set pan in freezer to set for a few minutes. Meanwhile, mix together all ingredients for the pumpkin layer. Sweeten more or less to taste. Spread the pumpkin layer over the bar layer evenly. Crumble the topping over the pumpkin layer to cover completely. Cut into bars and store in the refrigerator. These look incredible and the fact that they are no bake is even better! Just 11 ingredients and no-bake? A totally killer recipe, Lori! Wow, thanks so very much Sabine!!! Yes I’m all about the no-bake treats! And I’m loving these pumpkin beauties! I love that this is no bake! Yum! So glad you will put it to good use! I’ve been drooling over these all day and wishing I had one! I love the ingredients and can’t wait to whip some up, thank you for sharing! 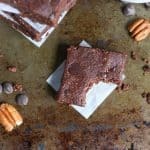 I can get lazy so I love no bake bars! Can’t wait to try these. Yes! A lazy bakers best friend! I’ll take all the pumpkin things, thank you! 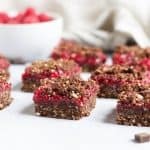 🙂 Looks so delicious and love that these bars are no-bake. Yum! 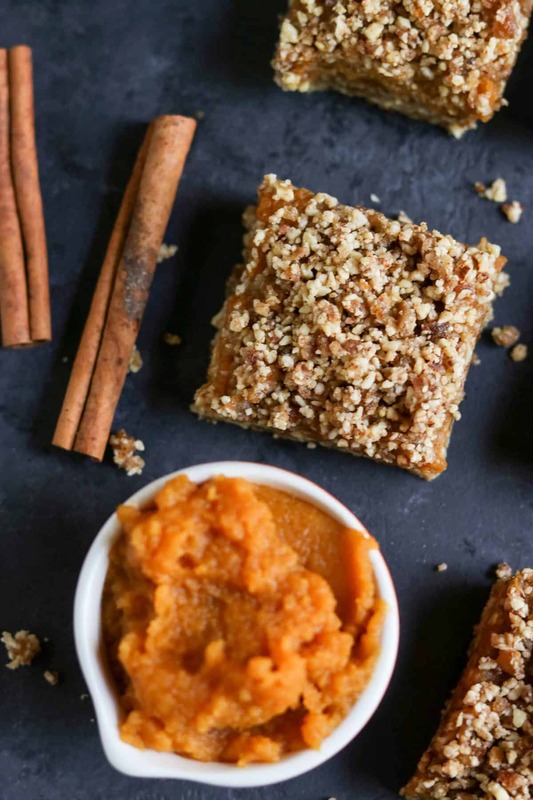 Yes, the best fall treat!